When I was younger, I worked for about a year in a chocolate shop. There were homemade truffles and chocolates made with such delectable ingredients like pistachios, hazelnuts, Grand Marnier, coffee, oranges or strawberries. It was incredible. The displays were just beautiful with chocolates in different shapes and colours. I did not make the chocolates. My job was selling it! I was behind the counter, flashing the smile and lending a listening ear. That is an interesting thing about working in a chocolate shop. The people that come in there have a story to tell. They need a special something for someone´s birthday and want to know what is recommended. They have had a crappy day and just need that little treat to cheer them up. Others would just come in because they were buying a special treat for themselves because they figured they deserved it. I liked that! On the whole, I enjoyed the job. When I tell people about this they ask me if it was hard not to eat the chocolate. The answer is no. It was not hard. I like chocolate but I can generally take it or leave it. That being said, there was one thing that I did find hard to resist and that was the candied orange peel. It was dipped in dark chocolate and it was just incredible. 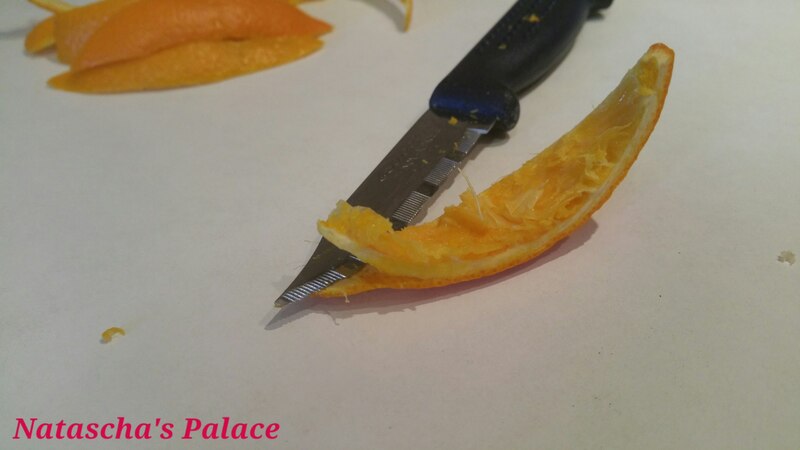 Years later, when I was making goodies for Christmas, I got the idea into my head to try and make those peels. I found the recipe and it is just perfect. 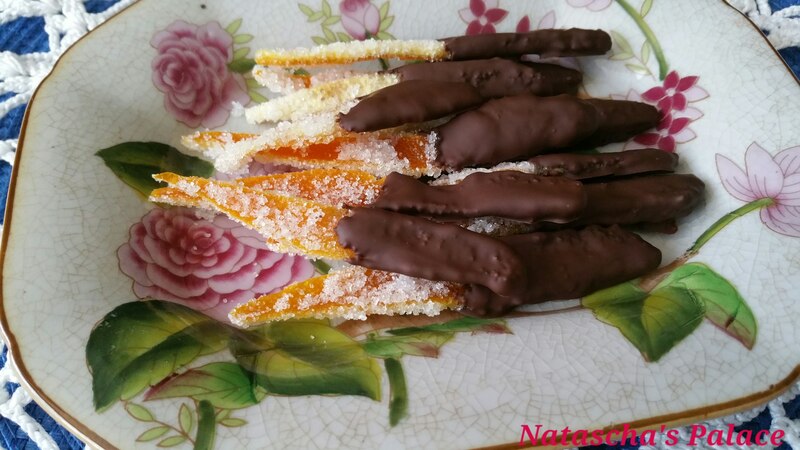 I have to share it with you because maybe you will discover a favourite too.Candied orange peel is not cheap to buy but it is cheap to make! It is definitely worth a go. Keep in mind that this is a recipe that requires a bit of time. You can dip the peel in dark or milk chocolate. I prefer dark in this case. I make these for my husband and when I do, he is SO happy! I should also tell you that you don´t need to dip them in chocolate. They are quite lovely on their own. Cook in large pot of boiling water 15 minutes; drain, rinse, and drain again. Bring 3 cups sugar and 3 cups water to boil in medium saucepan over medium heat, stirring to dissolve sugar. Add peel. Return to boil. Reduce heat; simmer until peel is very soft, about 45 minutes. Drain. 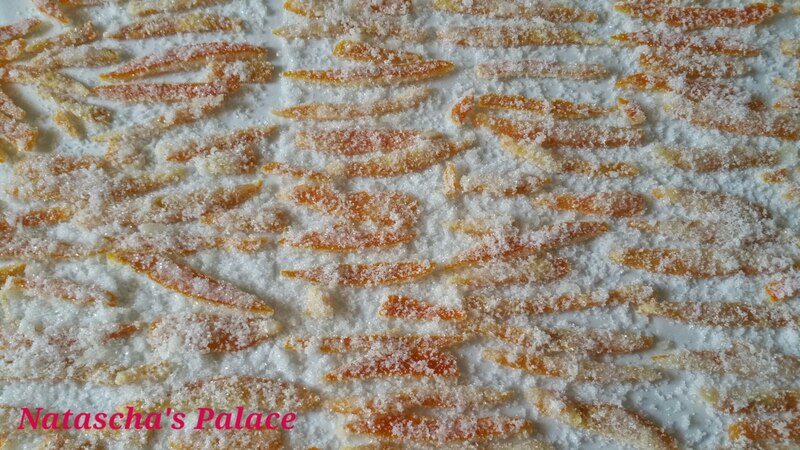 Toss peel and 1 cup sugar on rimmed baking sheet, separating strips. Lift peel from sugar; transfer to sheet of foil. [I use parchment paper. ]Let stand until coating is dry, 1 to 2 days. [Shake off any excess sugar] DO AHEAD: Wrap and freeze up to 2 months. I used about a 100 g of chocolate but always have extra around just in case. The oranges I use are usually juicing oranges and the peels are smaller. Use your best judgement on just how much chocolate you need. I melt my chocolate in double boiler and then dip only half of the peels in. I use a spatula to scrape off excess chocolate. I have noticed that when I didn´t do this, the chocolate just broke off of the peel when I tried to remove them. A thin layer of chocolate is perfect! Then I set them on a tray covered with parchment paper and leave them to dry in a cool, dry place. If you find that that the peel does not dry like it should, don´t panic. This could be because the peel was not sufficiently drained after being boiled in the sugar. This has happened to me. All I did was sprinkle a bit more sugar and it dried quickly. Do not cover your peel as you are waiting for them to dry. This will increase their moisture. I store mine in an airtight container and keep them in a cool,dry place. 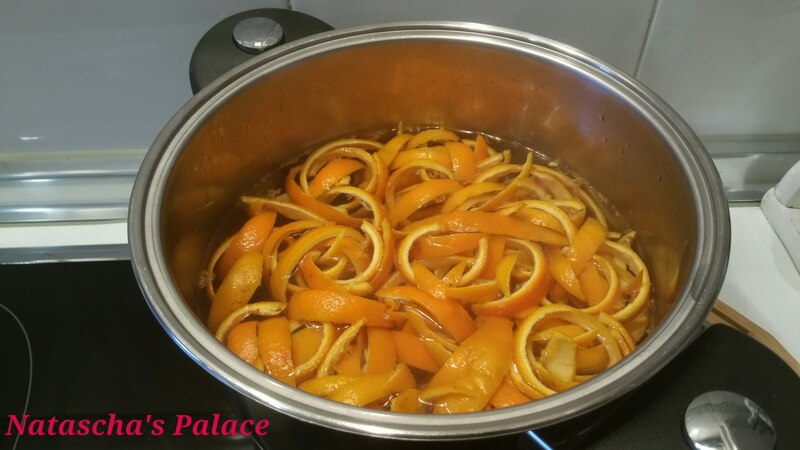 I make small batches because over time, the peels harden and are not as soft and flavourful. These are great to add to breads and cakes. 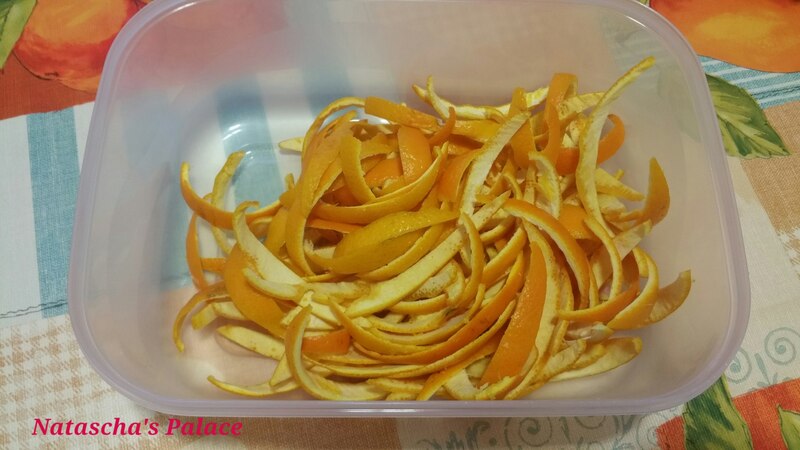 You can also try this with any other citrus peel such as lemon or grapefruit. I also worked at a chocolate shop and they sold these. Yours look great, I would like to try them. Wow these are just amazing! I love something so unique! These look great. 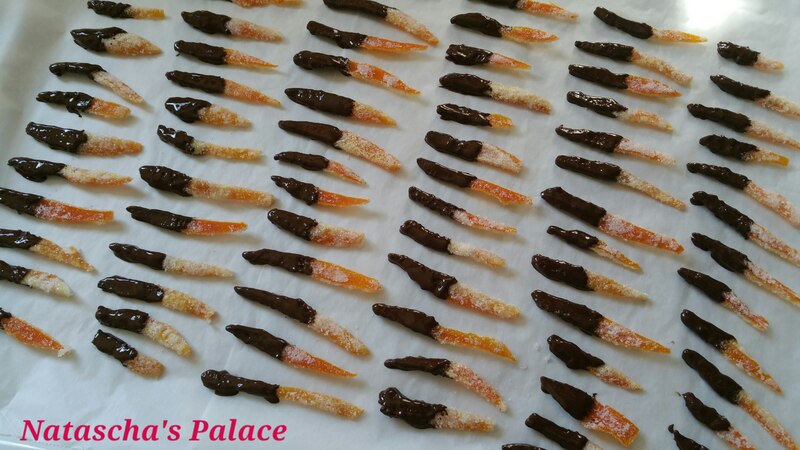 I never thought to make candied orange peels and freeze them. These look fab, what a great way to enjoy orange. So special! Thanks for the good tips too:) These would be great to set out for the holidays! Great idea! That would be really fun for the kids to do! Thank you again! I understand how you feel! I have been on holidays and have had so much fun having more free time. My holidays end on Monday and then it is back to work. I have to make time to do things I love or else I just go bananas!